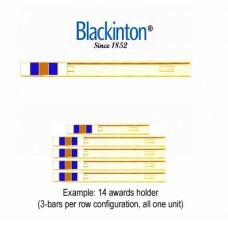 Cab-Slide Holders (All one unit: 3 commendation bars per row configuration, for multiple commendation bar awards) – Holds multiple standard-sized (1 3/8” by 3/8”) Blackinton® enameled commendation bars for a unmatched, handsome appearance. Each of your Blackinton® commendation bars slides securely into the Cab-slide holder, offering a beautifully streamlined, exacting appearance. As with each Blackinton® commendation bar, the Cab-slide holders are available in polished Rhodium™ (silver) and Gol-tone™ (gold) finishes to match the borders of your commendation bars! 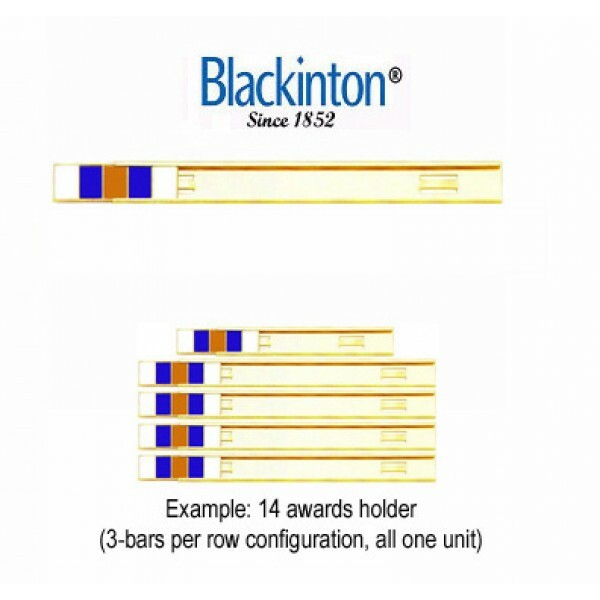 If you command higher standards of appearance then Blackinton® Enameled Commendation Bars and Cab-Slide Holders are for you. The Blackinton® name has been synonymous with expert craftsmanship since its early beginnings in 1852. Blackinton®… “Achieving artistry in metal”. That’s exactly what Blackinton® achieves. Versatility, creativity, and expert craftsmanship are Blackinton® hallmarks, and what makes Blackinton® badges, commendations, and custom insignia the number one choice of law enforcement and public safety professionals.